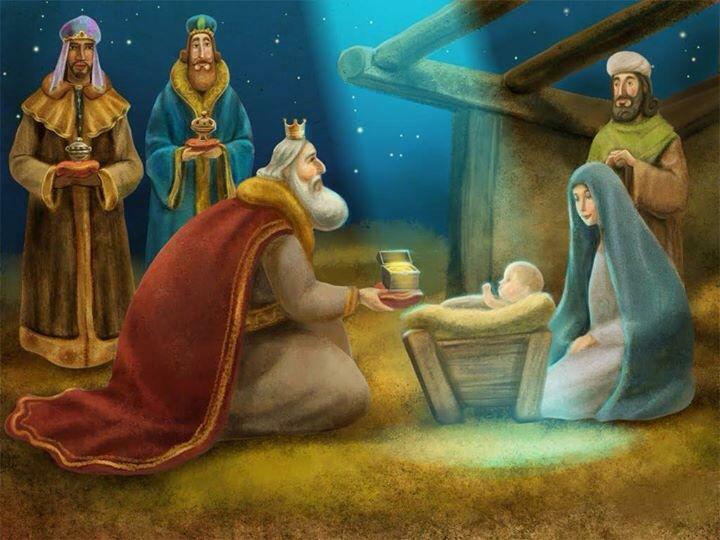 Today many nations, especially Latino ones, celebrate "Three Kings day." We know of this day as the day the Magi or Three Kings came to pay homage to the child Jesus. Many Catholic nations, in particular Hispanic ones, celebrate this day as they would Christmas. Children are told to leave some grass or hay under their beds, in their shoes or in a box so that the Wise Men can come on their camels and bring them gifts. This is common in Puerto Rico, Spain and many other Hispanic nations. In New York City, there is even a parade held. In some parishes, some parishioners dress up as the kings and hand out gifts to children while reenacting the visit of the Wise Men. This is a great way to evangelize at an early age. The story of the Magi, Wise men or Three Kings is one that has always gotten my attention even as an atheist. This story of three men coming from far away guided only by a star to adore a child is one that captures the imagination, especially for me who is a graduate of the sciences. The "Three Kings" or Magi (Wise men) traveled a long distance to find the child-God. God used His own cosmic version of a GPS to guide them with a bright star. This star could have been a comet, Jupiter, Venus or Saturn, or a conjunction of them; some believe it may have been a Stella Nova - when stars illuminate brightly for a brief moment and then return to their normal brightness. Jesus is the light that illumines the Magi and us today (John 8:12). This stellar phenomenon should remind us of this. One can literally visualize that night. It is such an amazing event that many cultures treat it like another Christmas day. However, the story is much more deeper than three men who are stopping by to visit a baby. They are bringing with them gifts that have specific meanings. Each came to bring gifts to the child-God Jesus Christ; the gifts of Gold, Frankincense and Myrrh. The gifts often are viewed as symbols of Christ's Royalty, Divinity, and Death. Others view them as Faith, Hope and Charity. We read in Scripture "... the caravans of camels and dromedaries from Midian and Ephah; all from Sheba shall come bearing gold and frankincense.." As a student of science, this story brings to mind the fact that these men were men of science and they searched for God in the stars. Science and Faith are not opposed to each other as Pope Emeritus Benedict XVI stated when he spoke of St. Albert, "St. Albert reminds us that there is friendship between science and faith, and that scientists can, through their vocation to study nature, follow an authentic and absorbing path of sanctity." Today, we have the Hubble telescope and all these satellites in space that take amazing high definition images of the universe. These images never fail to "wow" scientists and amateur astronomers alike. More recently, the probe New Horizons took amazing photos of Pluto. Just looking up at the night sky on a clear night brings the human mind to awe at God's creation. Unfortunately, we do not know much about them. They are foretold in Psalm 72:10-11. The Catholic Church believes there were three because of the three regions mentioned in this Psalm and the number of gifts given which represented each respective kingdom. However, the Orthodox Church believes there may have been as many as twelve. We know of their names (Balthazar, Gaspar, and Melchior) via the Excerpta et Collectanea text attributed to St. Bede (d. 735). The Wise Men represent the "outsiders;" the Gentiles, Pagans and others who were not part of the Chosen People - Israel. They also represent the different races coming to meet the Christ child. God calls out to them as well and they come to Him (John 10:16). God wants all to be saved (1 Timothy 2:4). We read in Scripture of the nations walking by God's light and that every nation will adore the Lord. The Magi represent the rest of the world coming to Christ. They are illumined by the Christ child's light and transformed. Unfortunately, many times some Catholics promote triumphalism instead of Catholicism. Triumphalism in the Catholic sense is the attitude that the Catholic religion is superior to other faiths and/or better. While the Catholic Church does contain the fullness of truth and is necessary for salvation, this does not mean that we are the best or should put others down who are not of our faith. We must remember that "the Gentiles are coheirs, members of the same body, and co-partners in the promise in Christ Jesus through the gospel" as the St. Paul tells us. The Pope is right. The Lord does not proselytize. He ate and drank with sinners and those who were the 'pariah' of society during His day (Matthew 9:11). Unfortunately, this behavior is often mistaken as Jesus being too open to all that He doesn't care about their behavior. This of course is not true for He, while being merciful, accepting and respecting all, called them to repent (John 8:11). God calls out to those who are not in the faith. He has His way of bringing them back. This is why I love Pope Francis' "meet them where they're at" philosophy. I have always believed this. We must be patient with those who left the Church or were never part of it. We must not judge them or treat them as if they are defects in the world. Pope Francis has showed already how by simply respecting others, brings them to consider God and Catholicism. Many homosexuals, atheists, protestants and others are opening up more to the Catholic Church even to the point of attending Mass because of this. They have begun their journey. We must help them, not push them back out by telling them they are not welcome, either explicitly or implicitly; via word or behavior. We must meet them where they are at on the path to God. Once we meet them there, we can direct them to the right road, so to speak. You can't give directions from miles away, you have to be close to the lost party. We must go to them. It is no wonder why the image on Pope Francis' pectoral cross is that of the Good Shepherd that leaves the 99 behind to get the one that wandered off (Matthew 18:12-14). Regardless of how others pray, have liturgy; or their attitudes on God and faith, we must trust that God will use these to bring them back to Him just like He used nature, astrology and science to bring the Wise Men to the Christ child. Science is not anti-God. Many atheists believe it to be the "killer of God;" however this is not so. The more we learn about the cosmos and our own planet, the more we realize that the only logical explanation for their existence is an intelligent Creator. I speak more to this in my new book 'Atheism Is Stupid' see: http://www.sacerdotus.com/2015/12/my-book-atheism-is-stupid-on-sale.html. This part of the story of the Wise Men is what I like to reflect on being that my area of studies are the sciences and science played a big role in my journey. In the story, we see how science leads the Wise Men to God. This is exactly what happened to me when I was an atheist (See "From Atheist to Catholic.."). I wasn't wooed into Catholicism by preachers, Bibles, Catechisms, theological books, EWTN, Popes etc. It was science, specifically the science of physics and astronomy that opened my mind to the 'Logos.' The popular suggestion "there was a big bang, then processes developed and we came from there.. accept it" did not satisfy my young scientific mind. I needed logical answers, not quick assumptions. Saying that we're here due to processes and that's how it is, does not cut it for me, so to speak. Like the Wise Men, I needed to get closer to "whom the Star pointed to." In my case, to whom particles and forces that make up the universe pointed to. The Gospel tells us the story of how God calls the 'outsiders' to the Christ child. Many times we think of the 'star' lighting the way to the Magi. In reality, it is the light of the Christ child that is lighting and guiding their way. Jesus is the Star. May we continue to look for the Christ child and stay focused on the Star which is God's grace - the light of Christ.